Wow, it’s hot! While many of us are beating the heat indoors, several military families stationed abroad are surviving the summer without AC. That’s right — select locations such as Germany and England are in temperate zones that experience only a few hot weeks a year. Because of this, homes (including those on military bases) do not often come with central AC. My family had the pleasure of being stationed in Germany for three years, and luckily I received vital insider tips from my German neighbor on post. For those of us who grew up in the States with AC, we don’t always know how to function without a cool, controlled indoor climate. 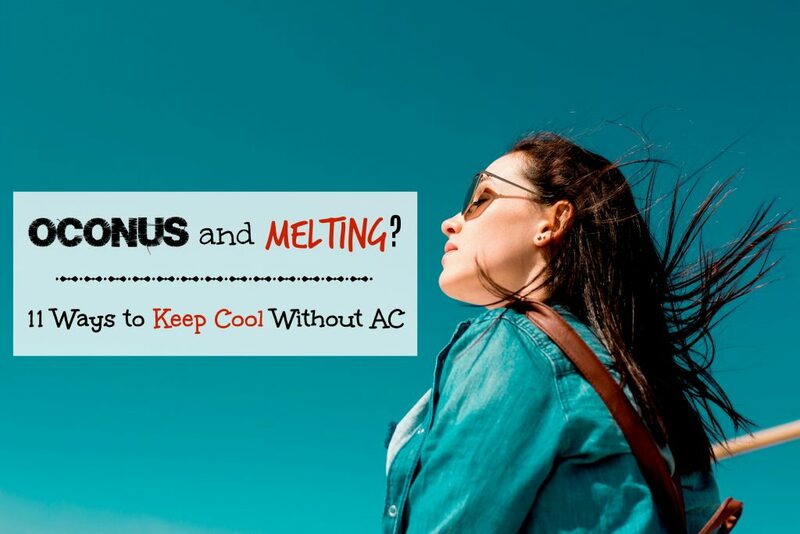 If you’re sweating it out, there are ways that you and your military family can survive the heat of summer… without air conditioning! Create a breezeway. To cool without AC, don’t open all your windows — only open one at the front and one at the back for each story of your house. Place a fan in the middle to draw air through and create a cooling airflow. Use window treatments to your advantage. Whether you have curtains, blinds or Rolladen, close them on hot days to block the rays. If your window treatments aren’t cutting it, you can always utilize cardboard from your moving boxes and cover them in aluminum foil to reflect out light and heat in your windows. Open it up early. Awake before dawn with kids or for PT? Open up your windows to cool the house while temperatures are still low. Consider leaving open overnight if you feel secure, and once the day starts to warm, close them up. If you’re in Germany, utilize your Rolladen to your advantage if your housing has them. Lukewarm baths/showers. If you’re melting in the middle of the day, your family can enjoy soaking (and playing if you have kids) in a lukewarm bath. Think of it as a mini indoor pool. Washing your hair and allowing it to air-dry can feel very cooling as well. Water play. If you have kids you can enjoy the fun and cooling effects of a kiddie pool, sprinklers, slip n slide, water guns and water balloons. In this heat, you won’t mind if you get splashed! Cold food and beverages. Now is a great time to enjoy popsicles, ice cream, frozen yogurt, and more. If you typically drink hot coffee, opt for its iced counterpart instead. Make sure to stay hydrated and add ice to your beverages for extra cooling. Use your kitchen strategically. When it comes to cooking, plan meals that don’t involve your oven. Sandwiches, salads, fresh fruits and raw veggies require minimal effort. If you want something hot, consider using a slow cooker, microwave or grill instead, so that you don’t heat up your entire house. Car AC for the win. Does your car have ice cold AC? Do you have a full tank of gas? Then hop on in, crank the air and some music, and take a scenic drive while chilling out. Get out of the house. Join locals who are at a community pool, splash pad, eating ice cream in a cafe, or enjoying a cold pint at the local pub. If you’re lucky, you may even catch a breeze or two. The distraction alone may be enough to help you feel cooler than if you were sitting and melting inside your house. Book a staycation. Look for nearby hotels (typically chains in larger cities who cater to tourists) that advertise AC and/or a swimming pool. Book it for the weekend to keep your cool! What are your favorite tips to beat the heat without air conditioning? 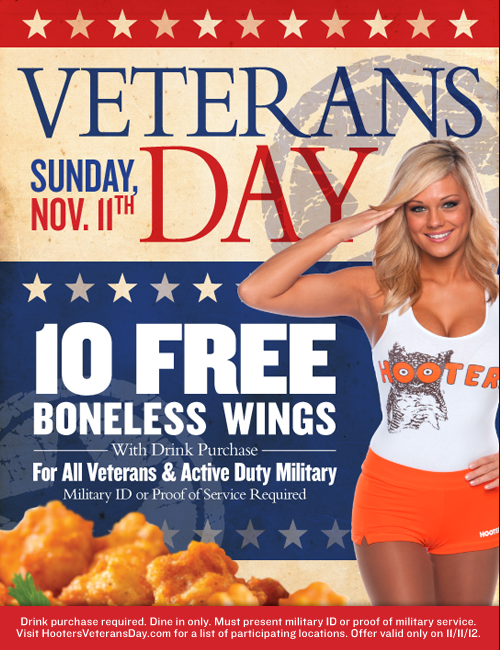 Hooter’s Veteran’s Day Deal…Tell Your Hubbies LOL!